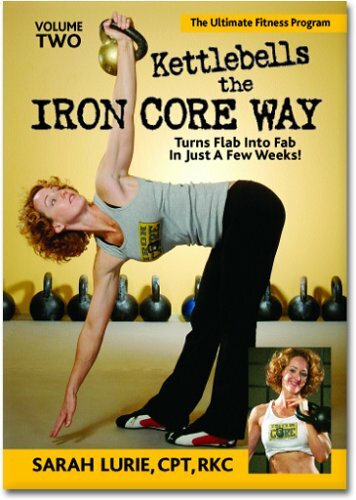 Iron Core Kettlebell is a neat collection of Sarah Lurie kettlebell workouts I got on Amazon for a great price. It is actually 4 separate workout DVDs that were originally sold separately: Kettlebells the Iron Core Way Volume 1 (currently $47.75), Kettlebells the Iron Core Way Volume 2 (currently $14.91 used, new $79), Iron Core Warrior (currently $34.62) (this contains 2 workouts) and Iron Core Bootcamp (currently $72.98). So, in this collection, I got 5 workouts which are currently going for $170.26 if you buy all of them seperately, for a mere $7.87. As you can see from what the individual workouts are selling for right now, I got quite a deal (and you can too!). Just for fun, I will post the DVD covers for the individual workouts next to their reviews–but that is not how I bought them. I bought them in the $7.87 collection which has the DVD cover featured at the very top. Now, each workout is not crammed onto a single DVD. There are 4 DVDs in this case and they are stacked, one on top of the other. I’ve never seen anything quite like it, but it works! All of the DVDs are in perfect condition. These DVDs are meant to be done in the order I am reviewing them. So, Kettlebells the Iron Core Way Volume 1 & 2 lay the foundation for the other workouts with Iron Core Warrior workout #2 being the most advanced of all of them. And Warrior #2 was too advanced for me. The others, however, are all my speed. There are some issues with all of these workouts that purchasers will have to decide how to compensate for on their own. None of the workouts have cool down/stretches. 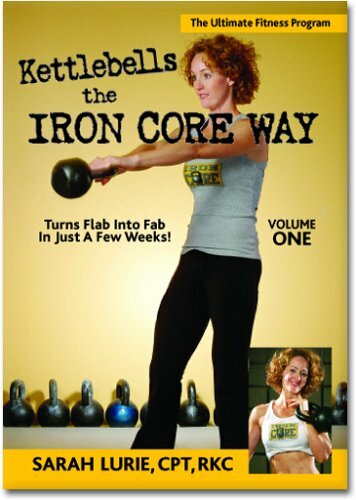 Only Kettlebells the Iron Core Way Volumes 1 & 2 have warm ups. And they all have either a lot or long rest periods throughout. Although in each review I will touch on the issues and possible solutions, I am going to give an overview here as well. First, the lack of cool down/stretch solution is easy–stretch yourself out afterwards! Kettlebell workouts tend to work your glutes, hamstrings, hips, lower back and shoulders the most. So make sure you give them all good stretches at the end. Lack of warm up can be remedied in several ways. First, if you are using the shorter workouts (the ones with no warm up) as an add on, well, you are already warmed up from whatever workout came first. If not, you can warm yourself up however you want, or you can use the first circuit as your warm up–just use a lighter kettlebell than what you will use in the rest of the workout. In all of the 30 minute workouts (Bootcamp and both Warrior workouts) you do 4 identical circuits–no warm up or cool down–so just make the first one your warm up. As for the long or excessive recovery periods, make them active recoveries. The Warrior workouts give you that option and offer an exercise you can do. The other workouts don’t do that but you can easily do some kind of cardio move–jumping jacks, squat jumps, high knee runs, burpees. Or do kettlebell swings or just continue to do one of the exercises in one of the circuits you just did. Do that and you can make these much more intense workouts than they already are. They all give the foundation for solid kettlebell workouts. With a little additional effort from the home exerciser you can make them excellent workouts. Oh, and use heavy kettlebells. 8-10 pound kettlebells aren’t going to cut it. Get some heavy kettlebells to make the workouts worth your while. I used primarily 20-30 pound kettlebells. Sometimes I would use a 10 or 15 pound kettlebell for an abdominal exercise. Kettlebells the Iron Core Way Volume 1 is 52 minutes long. 7 minutes of that is an intro/tutorial and 3:30 minutes of that is a warm up. There is no cool down/stretch. So if you skip the tutorial it is a 45 minute workout. This is an interesting workout. I say that because in the beginning it seemed too easy. But then I saw an easy way to pump up the intensity myself and it became a much better workout. This workout is set up in 3 circuits and each circuit gets more challenging (though none, on their own, are advanced). You do a lot of standard (and very effective) kettlebell moves. However, you don’t do a lot of reps and you get a 30 second recovery between every move. I got halfway through the first circuit and realized how easy it would be to make the workout more challenging. During those 30 second recoveries simply do something–more kettlebell swings, or continue doing the exercise that was just completed, or something else–jumping jacks, push ups, whatever. I did that and it made the workout much more intense and worth my time. Also, since you don’t do a ton of reps–make sure you are using heavy kettlebells to get the most out of the workouts. Even with these modifications this doesn’t become an advanced workout, but it does elevate it to intermediate and gives you a solid and worthwhile workout. There are some awkward camera moments for Sarah. During this workout, sometimes when you are coming back from break she is in the middle of giving “pointers” to the crew behind her (a man and woman). It is so obviously staged and fake. I’m not sure why it was even necessary. It’s not like she is using them to illustrate form or anything. Silly. Also, sometimes her rep count is off–so one side of the body may be worked more than the other. But this doesn’t happen a lot and due to the many breaks, you can easily fix it by doing those extra reps on the other side during the break. The menu has the workout broken down by tutorial, warm up and each circuit. So you can skip the tutorial if you want or one (or more) of the circuits–or you can just hit “Play all” and start from the tutorial, going all the way to the end. 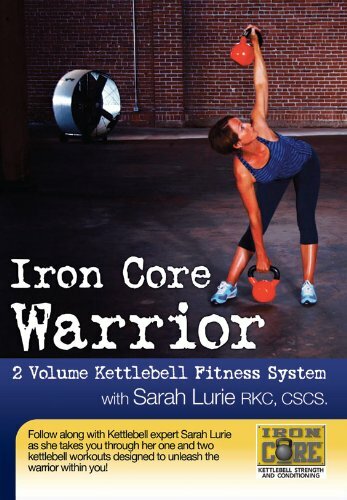 Kettlebells the Iron Core Way Volume 2 is 45 minutes long. 6 minutes of that is an intro/tutorial and 3 minutes is a warm up. No cool down/stretch. Skip the tutorial and it is a 39 minute workout. This workout is similar to Volume 1. Lots of breaks and it initially seems to easy. Once again, not a lot of reps, so use a heavy kettlebell. The exercises are a bit more challenging but if you go heavy and you use all of those breaks to do some kind of additional exercise or active recovery, you can still get an excellent workout. During this workout I either continued doing the exercise that had just ended or I did different varieties of KB swings. I got a very good workout. I do want to make a note about one particular exercise–the Deck Squat. This is a challenging exercise that has cropped up in more than one of the recent kettlebell workouts I have done. I have found a surprising (for me, at least) key to make this exercise easier: go as heavy as you can. The heavier the bell, the easier this exercise becomes. I wouldn’t have expected that, but it is true. Sarah has more of her awkward moments where she is having an obviously staged conversation with one of her crew members when you come back from break. She is giving them encouraging verbal support. It is pointless and so fake. The menu has this workout broken down by tutorial, warm up and each circuit. So you can skip the tutorial if you want or one (or more) of the circuits–or you can just hit “Play all” and start from the tutorial, going all the way to the end. The intro/tutorial demonstrates snatches, suitcase deadlifts, tactical lunges (reverse lunge passing KB under front leg) and deck squats. The warm up is made up of 5 swing-catch-squat (swing, catch KB by bell and squat), 30 second break, 3 Turkish Get Ups each side, 30 second break. 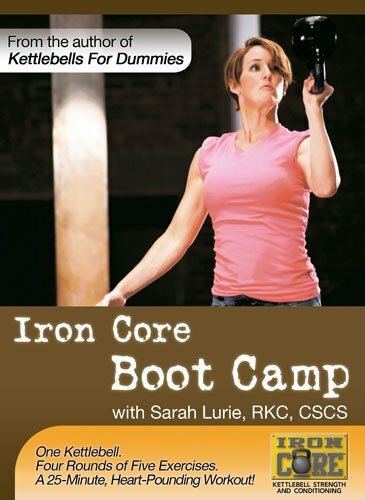 Iron Core Bootcamp is a short and sweet, awesome kettlebell workout–my favorite of the 5 workouts in this collection. It is 30 minutes long, no warm up or cool down; you are on your own for that. But I do have a suggestion here in a moment–but read on first. The workout is set up in four 5 minute circuits with a one minute recovery between each circuit. After those 4 circuits, she gives you a 30 second recovery then there is a 5th and final 2:30 minute circuit. Each circuit contains 5 exercises and each exercise is done for one minute (except the 5th and final circuit–that one is different). The first 4 circuits are identical so for your warm up, you can always just use a lighter kettlebell for the first circuit; however, you are still on your own for a stretch. Each circuit contains 5 kettlebell exercises and, as mentioned above, the first circuit is done 4 times. A different circuit is done one time to finish you off. She calls the final circuit the Ab Circuit, but as it is made up entirely of swings, I think it is more of a posterior circuit! Go heavy with your kettlebell(s) and you will get an excellent and intense workout in a short amount of time. I used a 20 pound KB for 2 of the exercises and a 30 pound KB for 3 of the exercises but I do think I can go heavier in the future on the exercises I used the 30 pound KB for. The ones I used the 20 pound for I think that was the appropriate weight for me. I used the 30 pound KB for all of the exercises in the final circuit and I think I could heavy up on that one, too. As I mentioned above–I love this workout! If you want to make it even more intense, create your own active recovery during the one minute rests–do burpees, or high knee runs or jumping jacks–or even kettlebell swings. The menu has this workout broken down by circuit. So you can do fewer circuits if you wish by starting the workout at Circuit 2 or 3 or 4–or you can just hit “Play all” and do all of the circuits straight through, Circuit 1 through to Ab Circuit. Iron Core Warrior contains two workouts: Warrior 1 and Warrior 2. They are both structured exactly the same as Bootcamp but the exercises are all different. No warm up or cool down. There is the same intro at the beginning of both workouts in which Sarah tells you that these workouts are created with the assumption/understanding that you have already completed Kettlebells the Iron Core Way Volumes 1 & 2–so you already know how to do all of these KB moves. Bootcamp is still my favorite of the 3 followed by Warrior 1. I didn’t like Warrior 2. Both workouts have menus that break the workouts down by circuit. So you can do fewer circuits if you wish by starting the workout at Circuit 2 or 3 or 4–or you can just hit “Play all” and do all of the circuits straight through, Circuit 1 through to the Ab Circuits. Warrior 1 is 32 minutes long. The workout is set up in four 5 minute circuits with a one minute recovery between each circuit. After those 4 circuits, she gives you a 30 second recovery then there is a 5th and final circuit. Each circuit contains 5 exercises and each exercise is done for one minute (except the 5th and final circuit–that one is different). During the one minute recovery between each circuit you can either rest, or you can do an optional active recovery move. There is a square at the bottom of the screen showing Sarah doing the recovery move: jump squats. If you don’t want to do jump squats–do your own recovery move. After doing the circuit 4 times you get a 30 second recovery before doing the Ab Circuit. This was a tough and excellent workout. I did like it, but I like Bootcamp a lot more. I used 25, 20 and 15 pound KB for this workout. I didn’t enjoy the 4 minutes of Hot Potato Russian Twists at the end at all. Very hard, but it also got boring. Ab Circuit: for the ab circuit there is only one exercise Hot Potato Russian Twists. You will do this move 4 times. Each time you do it, it is done for one minute with a 30 second recovery between. For this you will sit on the ground in C sit, knees bent and pressed together, feet off ground. Hold the KB by the bell and, with elbows pressed close to side, toss the bell from hand to hand while twisting upper body as if in Russian Twist. You will do this for one minute. Warrior 2 is 28 minutes long. This workout is very challenging and I will be honest, I didn’t really like it. You use 2 kettlebells of the same weight and, in order to get a good workout, you have to go heavy. Well, to go heavy with some of these exercises you need to be very skilled with a kettlebell otherwise it is dangerous. I am not that skilled. Plus, I only have two 20 pound kettlebells–all of the other kettlebell weights I own, I only have one. Two of the moves I just wasn’t going to attempt with 20 pound kettlebells so I used 15 pound dumbbells, which obviously defeated the purpose of this being a kettlebell workout. So, I probably won’t be returning to this workout. I’m not buying duplicate kettlebells just for one 30 minute workout. The workout is set up in four 5 minute circuits with a one minute recovery between each circuit. After those 4 circuits, she gives you a 30 second recovery then there is a 5th and final circuit. Each circuit contains 6 exercises (except the 5th and final circuit–that one is different). During the one minute recovery between each circuit you can either rest, or you can do an optional active recovery move. There is a square at the bottom of the screen showing Sarah doing the recovery move: jumping rope. After doing the circuit 4 times you get a 30 second recovery before doing the Ab Circuit. Ab Circuit: Russian Twists and Plank Holds. This circuit is 4 minutes long; you do 30 seconds of Russian Twists and 30 seconds of Plank Holds and just keep alternating with no breaks in between for a total of 4 minutes. I really don’t know what the trainer intended either. If you are using heavy enough kettlebells that you are challenging your muscles, then I wouldn’t do them on consecutive days (so every other day). But if your kettlebells are light enough that you are getting more of a metabolic cardio workout then you can do them every day. As for how long to do each DVD–I would stick with one workout until it no longer challenges you, then move up to the next one. Thank you so much for this review. It is actually quite informative and very helpful. I ordered the DVDs but was not sure where to start and your post really helped me out.